Kent mentioned he always enjoyed the Nut Horn cookies his mom made during the holidays. I sent a text to Lisa and she was able to send me a pic of the recipe. I also spoke with his mom to see if she could explain how she made them too. I was a little thrown off by the Seven Up. She also warned me that the dough was very sticky and you have to refrigerate overnight and keep it refrigerated while making the cookies. This was my first attempt. These cookies are a work in progress. Next time I make them it should be much easier. They are very delicious but not so simple. I was glad I could make them for Kent. I think only one of them looked like he remembered but at least he and the rest of the crew enjoyed how delicious they were. Hey, looks aren’t everything you know!! Preheat oven 375 degrees. Line cookie sheet with parchment paper. 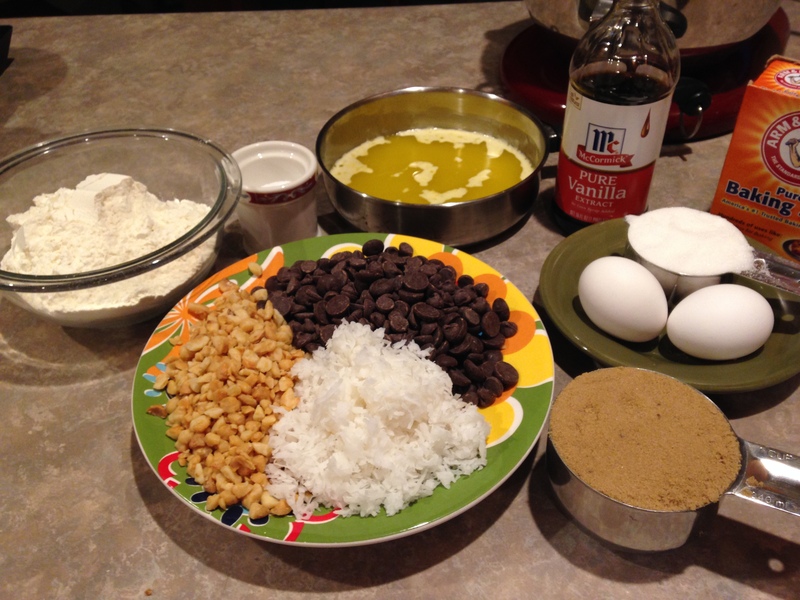 Mix together the cookie ingredients. I used my stand up mixer. Put cookie dough in refrigerator overnight. 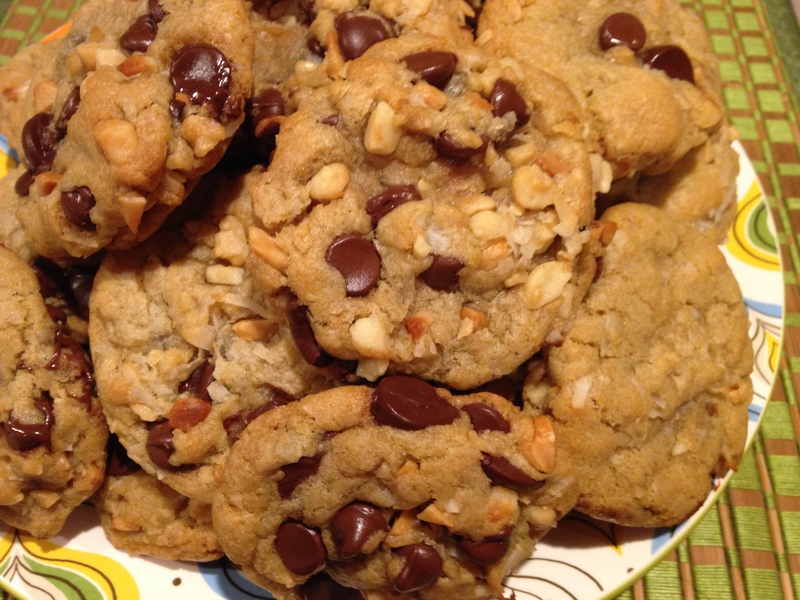 You can mix together the nut filling ingredients the day you are going to fill the cookies. It takes not time at all to mix together. I ground the walnuts in my food processor but you can buy them that way too. Next day you will take 1 inch balls of dough and with rolling pin roll between plastic wrap. I sprayed each piece of plastic wrap with Pam. This batter is very sticky to work with. Kent’s mom cut into a diamond shape, put 1 teaspoon filling in the middle, rolled into crescent shape. Pinch the dough to hold the cookie together. Do not pinch the ends. Place the pinched portion on the bottom of cookie sheet.If you don’t do this the cookie may not stay a crescent and will open up. Also, you don’t have to cut into diamond, you can roll as is. When I rolled out the ball, I tried to keep it more of an oval versus a circle. Dip half cookie in egg white and then in sugar. You can use colored sugar. I did not. For New Year’s Eve an Italian tradition is to have ‘good luck’ food. Every year my Aunt Mary would bring the lentil soup on New Years Eve. At midnight after everyone kissed and hugged each other we would eat sausage, lentil soup, cookies, fruit and the leftovers from dinner earlier that evening. I know there was a lot of food but I only remember what I enjoyed. Actually, I did not enjoy the lentil soup when I was little. I do now though!! Well, I found this lentil soup recipe and decided to make it for Christmas Eve. I’m a week early but this sounded so good I had to give it a try. I will make again for New Years. That’s how much we all enjoyed it!! Heat the olive oil in a large, heavy saucepan. Add the onion, carrot and celery and cook over medium low heat until tender and slightly golden, about 8 minutes. Stir in the cumin and cinnamon and cook for 1 minute. Add the lentils and broth and bring to a boil. Reduce the heat, cover and simmer until the lentils are tender, about 20-30 minutes. Stir in the spinach and simmer until tender. Add the lemon juice, season with salt and pepper and serve. Simple and Delicious!! Best of luck to you!! My brother, Tony texted me last night for a couple of Italian cookie recipes. The Italian Lemon and Italian Chocolate. I have been making these cookies for years. It just so happened this weekend is my cookie making weekend. Since he is so crazy busy I thought I would make them and send some his way. I ended up baking those today along with the Spritz cookies. They are boxed and off to Syracuse (sent some to Scott too) for Christmas Eve. Here is the Italian Chocolate recipe I got from the Syracuse Newspaper many years ago! Add shortening, whiskey and milk. Mix on low to blend together and increase to medium until all combined. Add chopped walnuts and mix into batter. Form dough into small balls, press slightly. The dough balls weigh 1 ounce or about 1″ rounds. Bake for 15 minutes. I turn the baking pan around after 7 minutes. Remove from oven and dip immediately in a chocolate frosting. 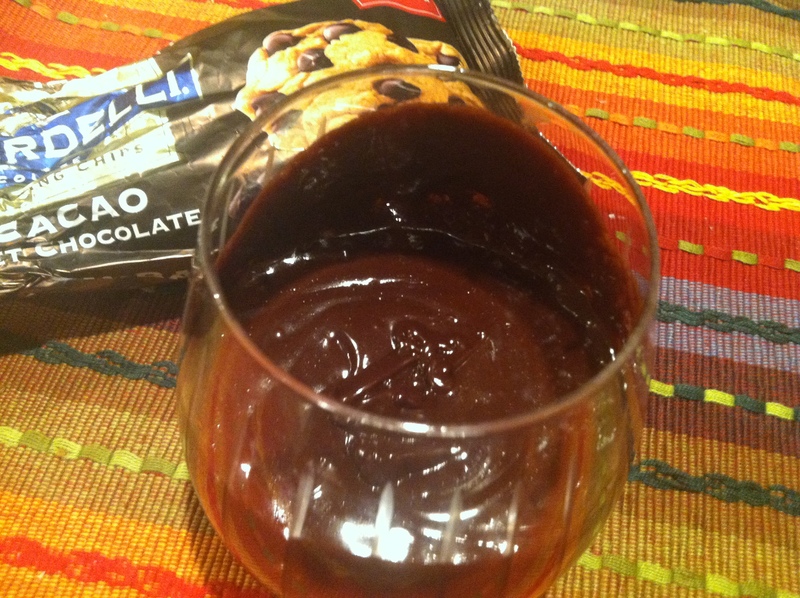 I dip in a chocolate ganache. You could do frosting or a chocolate glaze. Whatever works for you. Enjoy and have a wonderful Christmas and a Happy New Year!! December 2015; Saw these on my blog last night. Thought I should make them again. Great choice! You should add this recipe to your holiday cookie list this year!! First post March 2014; Eric saw the recipe for the German Chocolate Cake. He thought a cookie with coconut and nuts sounded enticing. I found this recipe and gave it a shot. They are quite tasty. I need to get Eric’s opinion though. Eric and Rachel will be over for pizza night tomorrow. We shall see what they think of these very “simple and delicious” cookies! 2. Using stand up mixer, cream together butter and sugars. Beat in eggs and vanilla. Add in dry ingredients until combined. 3. Add coconut, macadamia nuts and chocolate chips. Stir together by hand. 4. Drop cookies (about 1-2 Tablespoons) onto parchment lined cookie sheet. 5. Bake 15 minutes. I rotated cookie sheet half way through. This helps to make an evenly baked cookie. I was in the kitchen trying to figure out what to make for the weekend. I mentioned I wanted to make another bundt cake. Martin suggested a gingerbread bundt cake. He wanted me to add toffee bits to the batter and top with a chocolate peppermint glaze. I wasn’t too sure about this. He likes to challenge me with different recipes and random ingredients. I, like aways, accepted the challenge. I am glad I did because this cake was simple and delicious. Preheat oven to 350 degrees. Lightly grease and flour a 10-12 cup bundt style pan. In a large bowl whisk together the flour, spices, salt, baking soda and baking powder. Set aside. In a separate bowl (I used my stand up mixer), beat together the butter and brown sugar until fluffy. Add the flour mixture in three additions alternately with the water, starting and ending with the flour. Mix until smooth. If using toffee bits, stir into batter. Pour the batter in the prepared pan, smoothing the top. Remove the cake from the oven, cool in pan for 10 minutes, the turn it out onto plate. Pour the ganache over the top and allow to drip down the sides. Top with toffee bits. Allow time to cool and serve. Enjoy for this holiday season or any time of year!! Simple and Delicious. Need I say more! 1. Put chopped chocolate in small mixing bowl. 3. Pour cream over chocolate and whisk until smooth. Add vanilla extract (or extract of your choice) and your done. This is a thin frosting. It is more like a glaze. I drizzled over my Snicker Cheesecake, Chocolate Sour Cream Bundt cake and Gingerbread Bundt cake. I am sure you could think of many things to do with this rich, chocolate deliciousness. Like ice cream is a start! I am on a bundt cake roll this Holiday Season. I was going to bake my Italian lemon cookies tonight but I am too lazy. Why not a lemon bundt cake? 3. Whisk together flour, baking powder and salt in a separate bowl. Add to creamed mixture alternating with milk. Stir in lemon zest. 4. Pour batter into prepared bundt pan. Place in oven and bake for 50-60 minutes. Place all ingredients in medium bowl and whisk. I always sift the confectioners sugar. I don’t like lumps in my glaze and that seems the best way to prevent that.